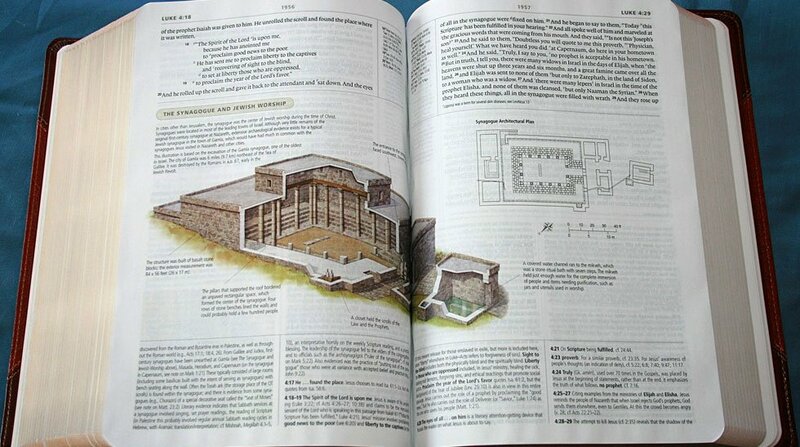 A lovely ESV Archeology Study Bible, crammed full of extra features and content. Why not proudly have this open on your coffee table for visitors to admire rather than a glossy illustrated ‘normal’ “coffee table book”. Chances are you already have a Bible, indeed, according to the American Bible Society, over 82% of Americans have a Bible in their home, and 25% have more than five. Bravo. So why read a buyer’s guide to Bibles if you already have at least one? Because approximately one in eight Americans bought a(nother) Bible last year. The Bible is not only the all-time best-seller, but it is an annual best-seller too. So, sooner or later, you’re probably going to buy another Bible, too. To encourage you to do so, the Bible publishers – only mildly constrained by the fact that the underlying Bible text is (or at least, should be) unchanging, keep coming out with new “packaging” and versions to encourage us to add to our collection. These days we are greeted with a stunning variety of different sizes, shapes, colors, and styles of Bibles, with all sorts of combinations of ‘extra features’ and content, and many different layouts. Plus, of course, there is the profusion of modern Bible translations to choose from as well, with more continuing to be released. That’s another issue entirely, which we’ll gingerly address in a future article that discusses the pluses and minuses of different translations and the surprisingly controversial nature of these choices. Bible printing is one of the few remaining examples of true craftsmanship in the book printing/publishing/binding trade these days. Most books are necessarily printed as inexpensively as possible, for two reasons. Firstly, few books are read more than two or three times. How many times did you read the last book you purchased? Unless it is a text or reference book, you probably read it once or twice, maybe someone else read it too, and since then, it has sat untouched on a shelf. A typical book doesn’t need to be durable. But a bible is something that will probably – hopefully – be read hundreds or thousands of times over its life. And its life might be longer than yours – the tradition of a family Bible that gets passed down from generation to generation is as valid today as it was in your parents’ time and in their parents’ time and ever before. If you don’t already have a designated Bible to be passed on, or perhaps even one for each of your children, we urge you to get one/them now, and to choose editions which truly will withstand years, decades, and generations of loving use. So, clearly, Bibles needs to be much more robust than typical books. The other cost issue is that a typical rule of thumb is that you take the actual printing cost of a book and multiply it by five to get the retail price of the book. If it costs $4 to print, then you sell it for $20. But if you can bring the printing cost down to $3, then you can sell it for $15, a big difference. Books are never inexpensive, and buyers are always price sensitive, so publishers are keen to keep their printing cost as low as possible, making as many compromises as they think they can get away with when it comes to paper quality, binding, and so on. While we, as Bible purchasers, are also price sensitive, the requirement for longevity overtakes the requirement for cheapness and so publishers choose to spend more on good printing, paper, covers and book-binding, resulting in a quality of final product such as is rarely found in any other books these days. But, even so, there are some necessary compromises that publishers are forced to make. Let’s look at some of the issues to do with choosing a Bible. As we discuss in great detail in our article “How Many Words in the Bible“, the Bible is a very big book (or, to be exact, collection of books). There are about 775,000 words in a typical Bible, and with modern “Study Bibles” with lots of commentary and other articles, it is possible to have well over a million words. A typical novel is somewhere between 60,000 and 100,000 words. A really long book might run 150,000 – 200,000 words (Tom Clancy’s “Hunt for Red October” is estimated at about 200,000 words, the original Harry Potter book was about 77,000 words but by the time of the “Prisoner of Azkaban” came out, they had grown to about 107,000 words). Tolstoy’s “War and Peace” – often cited as an example of an extraordinarily long book, comes to about 395,000 words. So a Bible is about ten times longer than a typical novel, five times longer than a lengthy novel, and twice the size of “War and Peace”. Now think about the physical size of a lengthy novel. And then multiply it by five. You would end up with an enormous sized book! And therein lies the problem. There is a practical size limit for a book – if it gets too big, it is too unwieldy, and its binding becomes too stressed by the weight of the pages. Even splitting the Bible into two – the Old and New Testaments – doesn’t really solve the size problem, because this doesn’t exactly halve the Bible. The New Testament is “only” about 180,000 words (ie two moderately long novels). But the Old Testament is a massive 610,000 words. This makes it reasonably easy to print New Testaments using normal methods, fonts, and papers, but Old Testaments and complete Bibles remain a problem. So, how to reduce the potential size of a Bible down to a workable and practical size? This inevitably requires some compromises, and it is important to appreciate these when choosing a Bible. The most obvious compromises are to reduce the size of the print – the font size, and to reduce the thickness of the paper. Additional compromises include reducing the distance between each line of print, having no gap between paragraphs, and reducing the margins on the sides of each page. Smaller print, more squashed together, and longer line lengths all reduce the readability of the content, and thinner paper is less durable and more subject to “print through” (having the printing on the other side of the page appear in the background when looking at each page). So all of these compromises, while collectively necessary, are unfortunate and not good. You need to decide which factors you can live with and which you can’t. Let’s look at them carefully. An obvious and visible consideration is a Bible’s size and weight. If you are simply wanting a Bible for home use, then this is not so much a constraint, and we suggest in such a case, generally the bigger it is, the better (because it allows larger fonts and easier to read layouts). The size/weight of a Bible is determined not just by the fonts and typesetting, but also by the paper thickness, so when evaluating different Bibles, it is important to understand not just the outside measurements of the Bible and its thickness, but also how many pages are inside it. Some types of paper can be twice the thickness of other types, and so it is helpful to know how many pages there are – and just like, in general, the bigger the Bible, the better, it is also very true to say that the more pages there are, for a given size, the better, too. Many people want a pocket or purse Bible, which needs to be very much smaller, or perhaps a travel Bible, which needs to be as light as possible due to ever more restrictive limits on the weight of luggage we can travel with. Bibles which are described as “thin-line” have thinner than normal paper to reduce their thickness. There are no ideal sizes to consider, just be aware of the varying size/thickness/weight/page count of the different Bible alternatives you are considering and choose based on how you’ll use your Bible. There are several different ways of presenting the text in a Bible. Until recently, the most common way was to have each verse start on its own line, and to show the number at the start of the line. Then a modification became popular, where each chapter would have a clear start, but the verses within the chapter would run together, with occasional paragraph breaks where the editors thought most appropriate and helpful. The verse numbers would appear in the text at the start of each verse, but with no line breaks. A new layout has also been offered – a “reader” Bible where there are no verse numbers at all. It is said this makes it easier just to go with the flow when you want to read the text, as opposed to if you are looking up a specific verse (in which case you’re obviously plain out of luck). We’ve never found verse numbers interfere with our reading so we like to have them. It is interesting to keep in mind that the original Bible text had neither chapters nor verses, so there is no magical or essential element of retaining them, but they do make it very much easier to cite or look up passages. 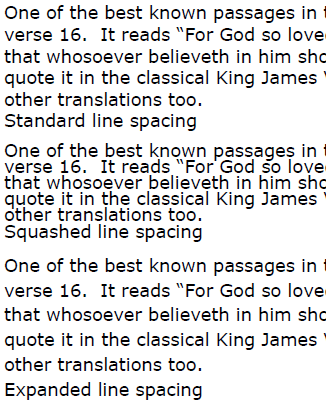 One other option which some people like is, in the New Testament, to have the words directly spoken by Jesus highlighted (usually by having them printed in red type). This can be helpful, but when you keep in mind that what you’re reading is an English translation of a text in Greek being a second-hand report, written several decades later, of what Jesus originally said in Aramaic (a form of Hebrew), you’ll hopefully appreciate that what you are seeing, in red or black, is far from the exact verbatim words he used. One of the biggest issues you need to consider is actually one of the smallest elements in the Bible you’re about to buy. The font size. If you’re in your teens or 20s, and with perfect eyesight, you probably don’t give this a second thought, today. But please think forward to the future, as well. Unavoidably, as you age, you inexorably will find not only do you need larger and larger font sizes to read comfortably, but you will also need eye glasses to read the font with. We have Bibles we’ve owned since our teenage years, and way back then, they seemed perfectly normal in terms of font size and easy to read. Now we look at them, with our glasses on, and strain to read them. So can we suggest that if you are young, you buy a larger size font than seems absolutely necessary, particularly if you are choosing a Bible that you know you’ll keep and return to regularly over the many years and decades ahead. And if you’re “no longer young”, then you know this already. Fonts are measured in point sizes. What is a point? There used to be a formal answer to that question, but these days, not so much. Suffice it to say that the bigger the number, the larger the font, and the smaller the number, the smaller the font. Normally, most generally printed material, like brochures, use 10 – 11 point type as a “normal” font. Business correspondence often goes up to 12 pt, particularly because, in the past, poorer office printers made it necessary to print text in larger size for clarity. Larger than 12 pt and it starts to become noticeably larger than “normal”, and if you go to 14 pt or more, then it becomes distinctively/unusually big. But, on the other hand, 9 pt definitely starts to look small, and unless the font is a very specialized font designed for maximum readability at small size, and very well printed, when you start to go much below 8 pt you’re getting really small. Note that although we’re talking whole numbers here, point sizes can also be fractions or decimals. 9.5 pt or whatever. Different fonts and apparent sizes, but all the same point size. Now for a confusing thing. Depending on how a font is designed, it can “look” bigger or smaller, and take up more or less space, even though it has the same point size as another font. We have created a sample page with eight different fonts, all 11 pt, but some take three lines and others take up to six lines to show the same text, and some are much more readable than others. Click here to see a larger version with more samples of the small image shown here. So you can’t automatically say, for example, “A 9 pt font is always larger and easier to read than an 8 pt font” because the publishers will carefully select fonts that are designed to look as good as possible at the small font sizes they are printed at. But, while there are exceptions, in general it is absolutely true that a bigger font will be easier to read than a smaller one, although the only way to be sure is to put the two Bibles side by side. Another obvious factor in how many pages are required to print a Bible is how closely the lines are squashed together. There is a theoretical “standard” line spacing for each font, and here’s an interesting thing – some fonts are designed for smaller line gaps than others. Indeed, if you look carefully at the font samples in the linked image, you might notice some variations in line sizing there. This image here shows the very big difference in readability that even a small difference in line spacing can give. It is important that the typesetting doesn’t squash the lines too much together. Understanding the appropriateness of the line spacing is something you really have to see. Something that is often overlooked these days is that there is an ideal length for a line of text. If it is too long, your eyes have to work harder to “keep their place”, particularly when shifting from line to line, and if it is too short, you have too many interruptions as you shift from line to line. An ideal line length is about 50 – 70 characters long. This means, for a Bible with a small font size and typical page size, it probably should have the text in two columns on the page rather than one. Publishers don’t always like that, because it means “more white space” (you need a gap between the two columns as well as margins all around the page) but from a readability point of view, the result is much better for you. This brings up the related topic of margins. You want to have some white space around the text, of course, including the “gutter” space which is where the pages are all bound together. If there isn’t enough gutter, you’ll find it hard to read the words where they go too far into the middle of the book, and/or it will force you to bend the book too far open to read those words, thereby stressing the spine and hastening the book’s failure. An important factor, particularly when size and weight are to be minimized, is using the thinnest possible paper. The US uses several confusing different ways of measuring paper weight/thickness. It is easiest to use the consistent metric system, where the normal photocopy type paper is usually described as being in the order of 70 – 80 grams per sheet of one square meter of paper – ie, 70 – 80 gsm. Normal books are printed on paper that ranges from about 70 – 100 gsm, and fancy “coffee table” type picture books can go up to as heavy as 180 gsm. As a rule of thumb, the lighter the paper weight, the thinner it is. Bibles tend to be printed on much thinner/lighter paper, with 40 gsm being a reasonably standard grade, and some of the lightest bibles now going down below 30 gsm. The problem with thin paper is not only its greater fragility, but also its loss of opaqueness, with the print on the other side of the page becoming increasingly apparent. Some paper promises to be more opaque than other paper of the same stated paper weight, but there’s no reliable measure of opacity that is used by all publishers, so it is something you really have to see to decide about, and some people are more (or less) troubled by print-through than others. One solution to this is “line matching” so the lines of print on each side of the sheet of paper coincide. The blackness of the print on the side you are viewing helps to obscure the faint image of the type on the other side. Better Bibles do this. In addition to opacity, another paper issue is how white it is. Opinions differ on the best degree of whiteness. If there is to be color printing, then the paper should be very white, and in general, white paper makes the black print more contrasting and easier to read. But some Bibles offer as a feature that they are printed on off-white paper. There are measures of paper whiteness, but they are not often quoted in the specifications for a Bible, and again it is something you really need to see to decide if it is important or not for you. You’re already familiar with the two most common types of books – hard covered and paperback/soft covered. Usually, but not always, these two different types of covers are matched by two different types of binding, ie, the method by which the pages are all joined together. Paperback books are usually “perfect bound”. To describe this simply, imagine a stack of all the printed pages neatly piled on top of each other. The inside margin of them all is then glued so the pages stick to each other and to the outside cover. Easy, quick, and simple. This works well for smaller sized books, and for books that won’t be used a lot and which will be treated carefully. But, as you know, if you fold a paperback book open too far, the binding “cracks” and you risk pages dropping out and the book starting to break apart, plus it no longer looks nearly as nice due to the cracks on the cover. Larger sized books also are less suitable for perfect binding and more stressed due to their greater weight and because the reader is more likely to open them “too far” and break the glue binding. Hard covered books might also be perfect bound to an inner spine, but the better ones will be “Smyth sewn”. In this case, each page is actually a double page folded in half. A collection of these double pages are stacked inside each other and then quite literally sewn with thread onto the backing/spine of the book (which is separate to the cover itself). Then the next collection of double pages are sewn alongside the first, and the third next to the second, and so on all the way through. If you look carefully, you can sometimes see the individual “signatures” of pages and find a middle page of a signature and see the threads in the middle. Smyth sewn books last very very much longer, and can more robustly withstand poor treatment. They are also much better suited for larger sized books. Smyth sewing is also of course more expensive, but it is money well spent and so unless you’re buying an absolutely lowest priced “budget” Bible (what are sometimes called “gift” or “Pew” Bibles) you should be sure that your Bible is Smyth sewn. Back to the cover choices. In addition to hardcover (usually with some type of rigid cardboard perhaps wrapped in cloth) or paperback with a light card cover, Bibles often come with flexible covers, traditionally made of some type of leather, and these days also offered in artificial leather-like substances too. Sometimes the artificial leather is made by mixing up a slurry of leather pieces and then gluing/setting it into cover form, other times it is made from artificial products that have never seen the outside of a cow (or goat). This again is something you really have to see, feel, and handle to have an opinion about. You may not have noticed or thought about it before, but most paperback books have covers trimmed to the exact same size as the pages inside the book, and most hardcover books have slightly larger covers so as to better protect the pages inside. With soft leather type covers, these are traditionally larger than the pages inside as well, with the extra amount of cover being termed the “Yapp”. Even if it loses its initial semi-rigidity, the leather style cover will still fold over the edges of the inside pages and protect them. Talking about the edges of pages, it is common to see gilt (and less commonly silver) edging on the pages. Some people believe this is to keep the pages waterproof, other people believe it protects the page edges from fraying or makes it easier to turn the pages. As far as we can tell, painting the edges with gold or silver is actually not at all functional (and for sure it makes pages stick together rather than easier to turn), and is simply a decorative finish. Perhaps there may have been some historic reason many years ago, but none of the claims of actual benefit from gilding have been accompanied by any science to back them up. But it does make a book look nicer. Some Bibles are gilded, and sometimes you have a choice of gilding colors. Others are not. Just like a movie on DVD, these days Bibles often come loaded with additional “special features”. A “Reference” Bible is one which has annotations in the margins or bottom of each page, referencing other passages elsewhere in the Bible where specific words and phrases appear. A “Study” Bible is one with extensive notes and commentaries, both on particular passages of text and also in general. It is possible for the commentaries to be almost as lengthy as the Bible text itself, with some Study Bibles having 20,000 or more notes added to the Bible text. One particular comment about Study Bibles (such as the one shown at the top of this article). They tend to print their supplementary material in a smaller font than the main Bible text. So, when deciding on a font size for a Study Bible, consider not just the size of the Bible text, but the size of the very interesting and helpful study notes, too. Another extra feature is to have section headings that explain the theme of the next part of scripture. These are editorial additions and not part of the actual Bible text of course, but can be helpful. A related extra feature is to have introductions to each book of the Bible, explaining who wrote it and when, what its main theme is, and other helpful explanation. Another helpful feature might be a table of suggested texts to read if you’re looking for inspiration on particular topics. Some Bibles have mini-Concordances added – sort of like an index, but more helpful than a basic index. These are of some value, but a serious scholar would want to have a separate Concordance. A Strong’s Concordance (probably the definitive and best of all Concordances) is actually bigger than a Bible. Some Bibles come with maps or other reference materials, historical timelines, tables of weights and measures, and other helpful information. Some provide texts relating the life and times and social customs of the day to the text, others talk about the buildings and places that were featured. Another thing you’ll sometimes find are reading and study plan guides, giving you sequential ways to work through the Bible. Sometimes you might find a “Harmonization” feature that places the events of the New Testament in chronological order. We don’t want to stray into the complicated and controversial topic of all the different translations available these days in this article, but we will quickly mention that if you’re by nature a compromiser, you can get Bibles that have two, three, or four translations side by side. Our favorite is a large-sized book that has two translations on the left side of each open double page and two more on the right side; we chose one with the KJV (which is always a great starting point for anything Biblical), the AMP, plus the NIV (very popular but not one of our favorites) and the NASB (highly regarded by many scholars). We were sorry it didn’t have the ESV in it, but there’s only so many versions you can put side by side. As you can imagine, if it is difficult to print a single Bible, imagine the added complexity of printing four Bibles in the one volume! Some Bibles have thumb-notched cuts into the long outside side of the Bible, allowing you to quickly index your way to sections of the Bible. Typically each notch is for three or so books. If you can’t remember exactly where in the Bible one of the books can be found (and we’ll admit to getting a bit vague ourselves with some of the Old Testament books) this can help rather than just thumbing through the whole thing and waiting for it to appear, or admitting defeat and looking for the contents to see what page it is on. It is common for better Bibles to have a page marking ribbon included. Some Bibles will have two, three, or even four of such ribbons, and in the case of multiple ribbons, it is helpful if they are of different colors. We feel the same way about Bibles as some people do about single malt whisky. There’s no such thing as a bad single malt whisky, these people say (is our Scottish heritage being revealed, here! 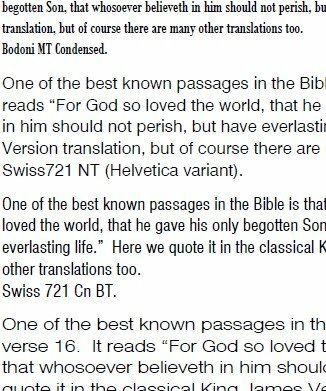 ), and similarly, there’s no such thing as a bad Bible (although, regrettably, there are such things as bad translations). There’s probably also no such thing as a perfect Bible, which is maybe part of the reason why many of us end up with so many Bibles. Just like knives, we buy different Bibles for different purposes. Most of us will have to compromise, making adjustments for the size we wish for and the price point we’re comfortable at. A high-end large-sized Bible can cost $200 or more, and while that sounds like a tremendous amount of money, when you compare it to a regular new best-selling book that might sell for $20, you’re definitely getting ten times as much quality and value in terms of the printing and bookbinding experience and longevity of the final book in your hand (and probably also ten times as many words). Indeed, here’s a challenge for you. Instead of having the glossy pictorial “coffee table” book on display on your coffee table, why not have an heirloom quality Bible on display. However, there are great Bibles in the $15 – $50 range as well, and if your budget is really tight, there are perfectly good Bibles for less. As with most things these days, Amazon is your friend. Another option is to visit a second-hand book store – they usually have a great selection of lightly used Bibles, and sometimes you’ll find some real treasures, at great prices. Please occasionally visit our Book Review page as we build up a selection of Bible reviews to help you further with your Bible buying, and feel free to ask us if you need any specific help or comments about a Bible you might be thinking of getting. One thing to consider – if you are traveling with a Bible, you might want to get a Bible cover. This is analogous to a computer sleeve/case, and is a lightly padded zip up pouch (or something similar to that) which you can place your Bible in. There’s nothing worse than having a Bible loose in your suitcase, and move around such that other things scrunch into its pages and damage it. We sometimes simply use an old padded envelope that Amazon sent us something in, but we’ve been meaning to get proper Bible carriers/covers. As always, Amazon has a range of such things available, with pricing ranging from about $10 to $30 or so. Be sure that the cover is large enough for the Bible you plan to place within it, of course.